It will be five years since Katrina on Aug. 29. The impact of Katrina is quite painful for regular people in the area. This article looks at what has happened since Katrina not from the perspective of the higher ups looking down from their offices but from the street level view of the people – a view which looks at the impact on the elderly, the renter, people of color, the disabled, the working and non-working poor. So, while one commentator may happily say that the median income in New Orleans has risen since Katrina, a street level perspective recognizes that is because large numbers of the poorest people have not been able to return. 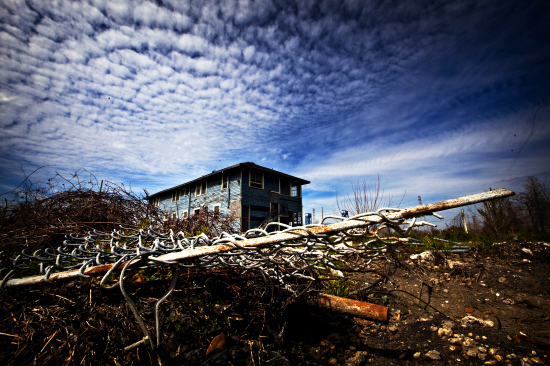 Five years after Katrina, tens of thousands of homes in New Orleans remain vacant or blighted. Tens of thousands of African American children who were in the public schools have not made it back, nor have their parents. New Orleans has lost at least 100,000 people. Thousands of elderly and disabled people have not made it back. Affordable housing is not readily available, so tens of thousands pay rents that are out of proportion to their wages. Race and gender remain excellent indicators of who is underpaid, who is a renter, who is in public school and who is low income. 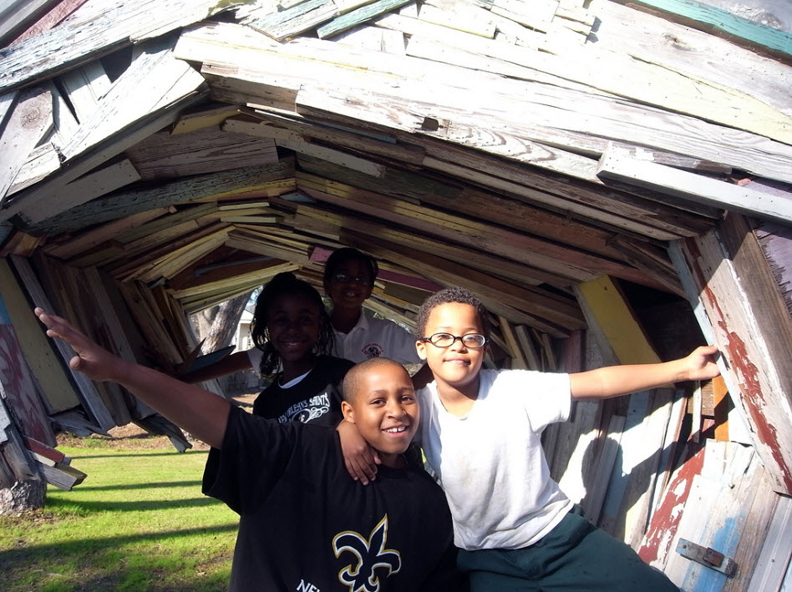 In short, the challenges facing New Orleans after Katrina are the same ones facing millions of people of color, women, the elderly and disabled and their children across the U.S. Katrina just made these challenges clearer in New Orleans than in many other places. Here is where we are five years later. Five years after Katrina, the most liberal estimates are that 141,000 fewer people live in the metro New Orleans area. The actual population changes will not be clear until official Census Bureau findings are released in November, but it is safe to say that over 100,000 fewer live in the City of New Orleans. The New Orleans metro area is made up of several parishes, primarily Orleans, Jefferson, Plaquemines, St. Bernard and St. Tammany. Orleans had 455,000 people before Katrina; now they have 354,000. Jefferson had 451,000 before Katrina; now they have 443,000. Plaquemines had 28,000 before Katrina; now they have 20,000. St. Bernard had 64,000 before Katrina; now they have 40,000. Source: Census Bureau. Louisiana residents are located in more than 5,500 cities across the nation, the largest concentrations in Houston, Dallas, Atlanta and San Antonio. A majority of displaced residents are women – 59 percent compared to 41 percent men. A third earn less than $20,000 a year. Source: Dana Alfred, “Where Did They Go and Are They Coming Back?” Louisiana Disaster Recovery Corps, 2007. More than one in four residential addresses in New Orleans is vacant or blighted – by far the highest rate in the U.S. Though the numbers have been reduced somewhat in the last three years, 50,100 residential properties in New Orleans remain blighted or have no structure on them. Source: Greater New Orleans Community Data Center (GNOCDC), “Benchmarks for Blight,” May 7, 2010, and Michelle Krupa, “Blighted Houses in New Orleans Dropping Steadily,” Times Picayune, May 10, 2010. About 58 percent of city renters and 45 percent of suburban renters pay more than 35 percent of their pre-tax household income for housing. Households should spend less than 30 percent of income on housing. Anything over 30 percent means that housing is not really affordable for that family and they are likely to cut back on other necessities. Source: GNOCDC, “Housing in the New Orleans Metro,” Oct. 13, 2009. Over 5,000 families are on the waiting list for traditional public housing and another 28,960 families are on the waiting list for housing vouchers – more than double what it was before Katrina and the government destruction of thousands of public housing apartments. Since the post-Katrina bulldozing of several major public housing developments, there has been more than a 75 percent reduction in the number of public housing apartments available. Source: Housing Authority of New Orleans. Under Louisiana’s “Road Home” program to rebuild storm-damaged housing, rebuilding grants for homeowners on average fell about $35,000 short of the money needed to rebuild. The shortfall hit highly flooded, historically African-American communities particularly hard. 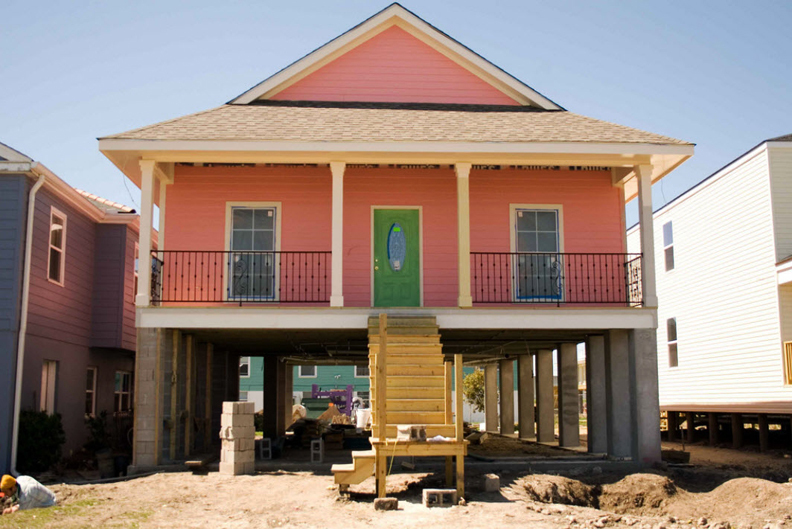 The Greater New Orleans Fair Housing Action Center filed suit in 2008 against state and federal agencies charging that the grant policy was racially discriminatory and that Black homeowners received far smaller grants than white homeowners. The judge in that case has opined that “on average, African-American homeowners received awards that fell farther short of the cost of repairing their homes than did white recipients” and, while noting the parties’ commitment to rebuilding New Orleans, found it “regrettable that this effort to do so appears to have proceeded in a manner that disadvantaged African-American homeowners who wish to repair their homes.” Source: PolicyLink, “A Long Way Home,” 2008, and Greater New Orleans Fair Housing Action Center. At least 19,746 applications for rebuilding homes that are eligible for funding have not received any money from the Road Home Program grant program. Source: The Road Home Program. The metro area has 95,000 fewer jobs than before Katrina, down about 16 percent. Source: GNOCDC and Brookings, “The New Orleans Index at Five,” August 2010. Black and Latino households earn incomes that are $26,000 (44 percent) and $15,000 (25 percent) lower than whites. White household income is $56,000, Latino household income is $41,000 and African American household income is $35,000 in the metro New Orleans area. Source: Jesuit Social Research Institute, JustSouth Quarterly, Summer 2010. New Orleans has a poverty rate of 23 percent, more than double the national average of 11 percent. But because of the loss of people in New Orleans, there are now more poor people living in the surrounding suburban parishes than in the city. Source: 2008 Census Bureau, ACS; GNOCDC, “Who Lives in New Orleans Now?” October 2009. Within New Orleans, the majority of households are lower-income. But an average increase of 5 percent a year in enrollment for the last two years – 35,976 to 38,051 from 2008-2009 alone – indicates that people whose children attend public schools continue to return as housing and employment opportunities allow. Source: Louisiana Recovery School District. In 2008, 85 percent of white students in New Orleans attended private schools, one of the highest percentages in a major city in the U.S. Source: SEF. New Orleans now has more charter schools than any other public school system in the country. Of the 89 public schools in New Orleans, 48, more than half, are charter schools. Sixty percent of students now attend privately managed but publicly funded schools. Source: Louisiana Recovery School District. Metro area has recovered 79 percent of public and private school enrollment. Source: GNOCDC and Brookings , The New Orleans Index at 5, August 2010. Over one-third of Social Security recipients who lived in New Orleans have not returned. There were 74,535 in 2004 and 47,000 in December 2009. Source: U.S. Social Security Administration. Medicaid recipients have declined by 31 percent: Pre-Katrina enrollment in Medicaid in New Orleans was 134,249. December 2009 enrollment was 93,310. Source: Louisiana Department of Health and Hospitals. Supplemental Security Income recipients are down from pre-Katrina 26,654 to 16,514 – a 38 percent decline. Source: U.S. Social Security Administration. Total ridership declined 65.7 percent, from over 33 million in 2004 to about 13 million projected for 2010. Source: Regional Transit Authority. Violent crimes and property crimes have risen in New Orleans since Katrina and remain well above national rates. Source: GNOCDC and Brookings, “The New Orleans Index at Five,” August 2010. Speaking of crime, there have been at least 348 intentional fires set in the Gulf of Mexico – controlled burns, they call them – since the BP spill. Source: “Deepwater Horizon Response,” July 14, 2010. About 1.8 million gallons of chemical dispersant have been dumped into the Gulf, over a million on the surface and about 750,000 gallons sub-sea. Source: Marianna Nash, “Scientists Dispersant Concerns Remain,” CNN, July 28, 2010. About 210 million gallons of oil (5 million barrels) were released by the BP spill. About 800,000 barrels were captured by BP – making it by far the largest oil spill into marine waters in world history. Source: Campbell Robertson, “U.S. Puts Oil Spill at Nearly 5 Million Barrels,” New York Times, Aug. 2, 2010. 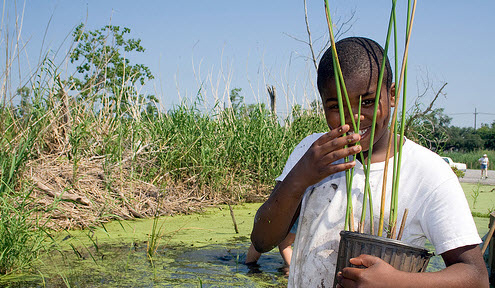 Since 1956, when measurements began, 23 percent of the coastal wetlands have converted to open water. Source: GNOCDC and Brookings, “The New Orleans Index at Five,” August 2010. The challenges of post-Katrina New Orleans reflect the problems of many urban and suburban areas of the U.S. – insufficient affordable rents, racially segregated schools with falling populations, great disparities in income by color of households, serious pollution from remote uncaring corporations, and reductions in public services like transportation. Katrina made these more visible five years ago and continues to make a great illustration of the U.S. failures to treat all citizens with dignity and our failure to achieve our promise of liberty and justice for all. Bill Quigley is legal director of the Center for Constitutional Rights. Bill and Davida Finger are law professors at Loyola University New Orleans. Lance Hill is executive director of the Southern Institute for Education and Research at Tulane University. You can reach Bill at quigley77@gmail.com, Davida at dfinger@loyno.edu and Lance at lhill@tulane.edu.